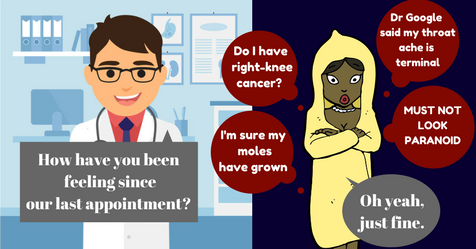 ‘Can you get cancer in your knee?’ I once asked my consultant, looking sheepish. 'Could you just check these moles?' I ask my GP. I’ve suspected I had bladder cancer, throat cancer, tongue cancer, brain cancer, womb cancer, liver cancer, lymphoma, sarcoma, breast cancer, nose cancer, and 50 million episodes of recurrent bowel cancer. Since my diagnosis, every ache, every little pain causes an uncontrollable spasm of fear. It’s impulsive. And however much I punch down the fear into my stomach, it grows and grows and grows. It’s impossible to know when to take these pains seriously. Who do you take them to? How long should symptoms exist before you book an appointment? And it’s always worse just before scans. A new health issue will haunt you, so convincingly a symptom of cancer that you just know the scan will show a recurrence. You don’t want to feel a nuisance, so you don’t trouble your health team. Besides, you don’t want them to mark you as paranoid, they might never take you seriously again. So when you’re struck by a 3AM Fear Cycle, you consult Dr Google. The statistics from the cancer charities make your heart drum, the adrenaline pouring through your body. You become trapped in the realm of Cancer. Every page warns of recurrence, sidebars full of advice on palliative care. And when anxiety kicks in, it’s hard to differentiate between the physical manifestations of your fears – breathing issues, increased heart rate, stomach aches, diarrhoea etc. - and the symptoms that caused the fear. I’m very lucky to have a good friend who is a doctor, but without medical friends, you need to find someone compassionate and understanding who will vet your health worries in a logical manner and is at the end of the phone during these times of all-consuming fear. This might be another cancer survivor; someone who ‘gets it’. Statistically, colds and flu will often be just that and not a symptom of a nastier illness. Coughs and snotty noses can be easily dealt with by the likes of Lemsip and Night Nurse. Addressing the symptoms will stop you dwelling on them and prevent your mind from making them seem like bigger problems than they are. Doctors often ask you to diarise symptoms. I have months’ worth of symptom diaries during treatment and thereafter. It helps stop The Fear take over. You can establish the facts of when symptoms actually started and then take this to your doctor. And who else has attended the doctor with ‘weird pains’ that you struggled to describe? It helps to give symptoms a description and a name. Be prepared and write down how it feels beforehand so you can be as precise as possible during the appointment. Who is the best source of support? Specialist teams usually help with concerns around the original tumour site, or with organs that relate to it, but for anything else they might instruct you to go to the GP. You generally have to sleuth out who is going to help with what, rather than the NHS having a clear system for who to contact. Sit down with your specialists and ask them exactly who to seek advice from, so you don’t encounter the stressful occasion where everyone bats you off to another provider and you feel like no one can help. You need to find a GP who understands. And you need a regular GP who you can personally request – who will become your ‘special person’. I went through three doctors to find my perfect match. I now have a GP who is willing to haul me in and inspect even the most minor of recurring ailments and is there at the end of the phone if I’m worried. This is the way it should be. Fear of recurrence is debilitating and can cause such anxiety that it prevents you from leading a full life. The Fear is an aspect of cancer recovery that the NHS recognises and should support. 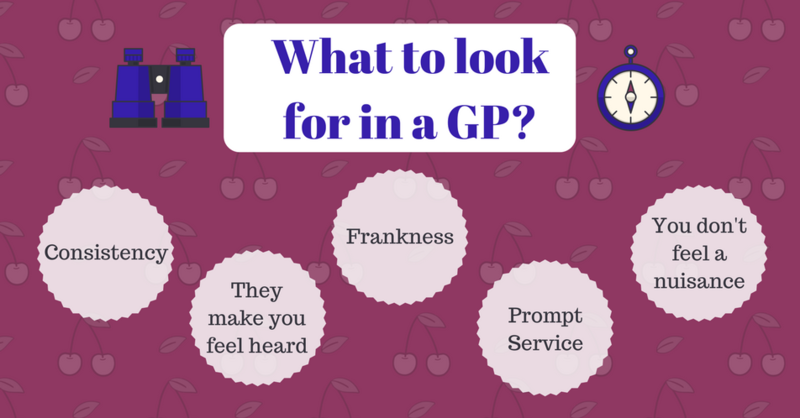 So what to look for in a GP? You need to feel heard. While GPs will take your health symptoms seriously and will understand that you have anxieties for your future health, not all GPs will make you feel that they’re listening. You need to feel heard in order to decrease anxiety. A frank and open relationship. Find a GP with whom you can talk freely and who doesn’t make you feel judged or a nuisance. Prompt Service. Waiting three weeks for an appointment will do nothing to help fears and anxiety. Many GPs now offer on-the-day appointments, so go find a practice that has a prompt system. Working Hours & Consistency. Some GPs do not allow you to see the same GP consistently, unless you arrange this with the practice manager or a GP personally. Choose a GP who has regular working hours and who will be a consistent support. If your symptoms are serious: breathing issues, heavy bleeding, heart-related and the like, I’ve always been told to go straight to A&E. That’s the same for intense pain, when they’ve suspected an obstruction in my digestion. You may feel like you’re wasting the time of A&E staff, but you’re not. They’re there to deal with these very issues. If in doubt, seek medical help immediately. If you’re facing something more minor: a new ache, a cough, or something that everyone encounters like a cold, again, you need to ask your docs when to consult them. In the early days of recovery from treatment, the body often struggles with colds and illnesses, so it’s worth getting things checked out pronto in case you need any prescribed drugs. Nowadays, I tend to leave the symptoms up to two weeks before getting them checked out. I tell myself that having a cold is perfectly normal. Everyone has colds. And they clear up. I only need see my GP if it doesn’t sort itself out, or is recurring, or if I have an unresolved high temperature. 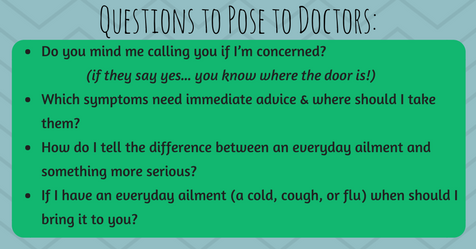 Important: All these decisions come as a result of a conversation I’ve had with my GP – we’ve discussed what symptoms to bring to her, how long to leave them, and her promise that she understands my health concerns. Every cancer survivor is unique in their health issues so do not take my circumstances as gospel. Have a frank conversation with your GP. 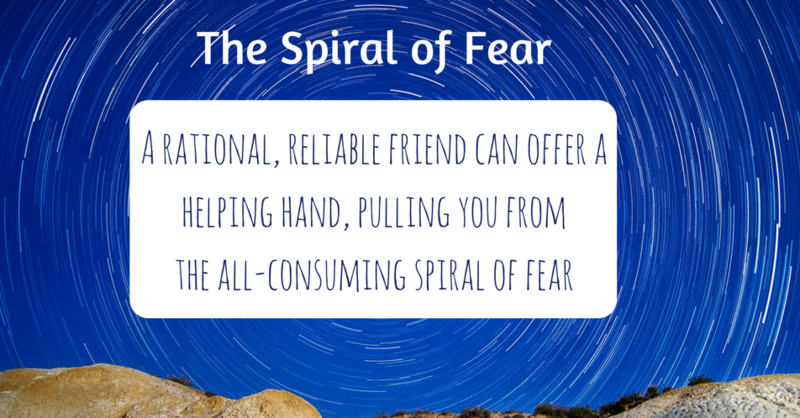 You’ll feel more in control and reassured that these fears are totally normal. And if this appointment doesn’t work? Don’t stress; off to find a new GP! I am continually amazed by the number of medics in the profession who are not up to speed on so many subjects. This includes Specialists. Hi. I have just joined. I found out I had bowel cancer on 23rd Dec 2017. I had surgery about a year ago followed by 6 months of chemo. Since chemo finished in September last year, I feel like the whole 'cancer'thing has just hit me. I was 35 at the time and have 2 young children so my focus then was just getting through the treatment without it all having too much effect on them. Since it has ended the 'fear'of it coming back has really hit me. I need some tips on how to live 'normally' again. If that is ever possible!